What's the speed limit for past a school bus that's stopped to let children off? What is the speed limit for vehicles passing a school bus that has stopped to let children on or off? What is the speed limit for vehicles passing a school bus that has stopped to let children on or off? Regardless of the direction you are approaching, you must slow down to 20kph if a school bus is letting children off, in case a child dashes across the road. The speed limit for passing a stationary school bus that is dropping off or picking up children is 20kph in either direction. Bear in mind that if you are used to driving in other countries, such as Australia, New Zealand's speed limit is lower. It's set low because at 20kph almost all pedestrians hit will survive, but at 50kph 20% will die. Children are more likely to run out into the road without looking, and the school bus is a large obstacle that obstructs their view of the road. If you are following a large vehicle that suddenly slows on a rural road, don't assume you can overtake; it might have spotted a school bus and is obscuring your vision of it. On rural roads it's possible to come around a corner and find a school bus on the side of the road, not leaving you much opportunity to slow down. Take care in these situations. You will see signs on school bus routes warning you that you could come across buses, therefore at school run times, be prepared to have to slow down. School buses are likely to be seen between 8-9am and 3-4pm on weekdays outside of school holiday dates. They might be public buses with a school sign on the back of them. School buses are restricted to 80kph in a 100kph area. 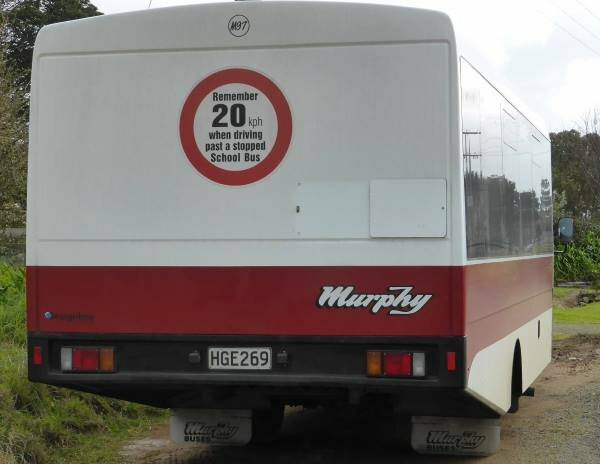 This image shows a school bus on the Awhitu Peninsula clearly marked on the rear with the 20kph signage. At an intersection or area of the road where a school bus turns, you might see this sign.